NIZARLAND: Becoming Contributor in Travel Magazine. How Come? Becoming Contributor in Travel Magazine. How Come? Traveling and getting paid from it are so interesting. I often do internet surfing and seeing the pictures in someone's blog about his/her traveling experience. That's so amazing and it makes me envy. Working in magazine to take pictures of beautiful sceneries and activities sounds fun as well. Since December, my classmates and I were asked by our travel photography mentor, Sasha, to do coverage of Jakarta. 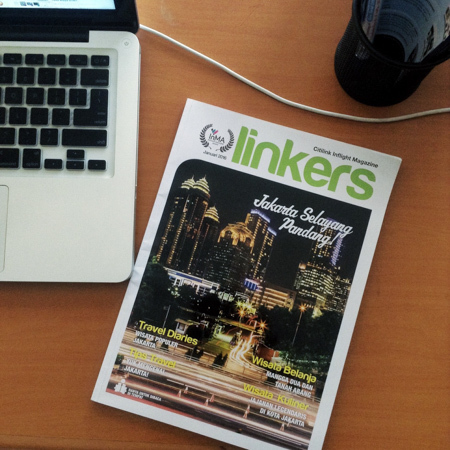 Sasha is editor-in-chief of Linkers, in house travel magazine of Citilink. Fortunately, we got privilege for being contributor in Linkers. This coverage activity has been done since a few months ago. However, I just joined in team since December. I feel like getting rare chance and being lucky for doing this kind of thing. We moved around Jakarta for taking pictures of historical places, tourist attractions and spots, legendary food, etc. Usually, it's easy to me for taking those kind of picture. Nevertheless, I did it more careful since I know these picture will be displayed in magazine. That's why I need to capture decent pictures.